When i first got the game I was like what the heck is this some chick game. I clicked "about this game" my ps3 took my to the internet browser. I Ended up watching it on Crunchyroll thought ill give the first episode a shot, Now im waiting for a new episode ended up watching the whole thing its not a show for chicks its a show about becoming famous through 14 teenage girls who are all different and relate to everybody. The animation is good for the genre the storyline right now explains all the girls so its a bit slow for now watch it. I think that this is a great anime but it lacks one thing! Dudes, if they want more people to be interested add men. Beside the fact that this is just a stereo type of all idols and there jobs I think this anime has some life maybe the girls can find a guy and boom you got a harem. Well i guess that would take all the fun out of it but still it doesn't make sense to fill a show with all girls I mean even If one guy was a sub or even main character I would watch it. Not to diss the producer guy but someone who can steal the hearts of the girls. -----When reading the synopsis and viewing the picture for this show it leaves an implication that it isn’t trying to be anything ambitious and merely be another cash-in on the moé franchise of the anime industry. The aim to make the viewer feel adoration toward its characters is not the problem in and of itself so much as the sheer volume of the cast creating issues with screen time. And with the story, animation, and music all being quite good, the large cast is perhaps the only major weakness this anime suffers from. -----Part of the reason the large cast hurts the series is the method the narrative uses to characterize or develop everyone. While the spotlight episode approach highlights the personality, gimmick, or problems of the idol of the week, for most of the characters it is the only time to be truly seen by the viewer. Now if one were to assume that all thirteen or so characters each has a dedicated following, then the unbalanced exposure inevitably raises the question of why someone who likes a particular character should keep watching if two or more of his or her favorites are not present. Worse still, much of the development is wasted or artificially dictated as many of the reasons for starting a spotlight episode are never addressed again while the story arcs of others could only have happened due to the chronological events of the narrative instead of being moved by the cast itself. One could make the case for the aforementioned problems as a natural side-effect of having a few main characters and a whole host of side characters, which is true. However even among those whom the show usually focuses on outside of the spotlight episodes, this group typically cycles between a few of the cast members. The [email protected] doesn’t have enough focus to call anyone its main character or characters and it doesn’t spread its attention to everyone enough to be called an ensemble. -----But if one is able to look past the wasted development and shafted characters, he or she might possibly find that to be the only problem with this show. The story itself might be familiar to some viewers but the sincerity in which the idols pursue their dream and the semi-realistic nature of their progress is uncommon to say the least. Some characters move from rehearsal to live performances faster than others, but nobody progresses from amateur to professional within the span of a single episode or even two or three. The fact that the most naturally gifted of the idols is not the first one to be drafted into a more independent trope highlights the reality of how even those with innate talent must hone his or her skill and avoid being complacent. Slowly but surely the thirteen idols come into their own and all of them become independent by the end of the series and there’s no noticeable jump from the lively 765 Pro, which indicates their beginning, to a vacant vicinity, which indicates them having gained the experience needed to move past that point; it’s a very subtle approach presented by a seemingly transparent narrative and it’s all the more impressive considering the thirteen different tracks of progress present. -----And as the idols gradually improve and are able to perform in more and more concerts, the anime is able to showcase a stronger example of visuals. The offstage animation isn’t lazy in places it shouldn’t be, and that same effort for the scenes where not much happens is carried over into the scenes where a lot happens, which are the performances. The concerts are nothing short of an excellent visual presentation, with very visible, constantly active choreography where the movements aren’t reduced to blurbs seen from the view of a camera that weaves above and around the stage and between the characters. A-1 Pictures shows some serious effort here as it could have left the varied character designs entice the viewer into watching, but it seems the studio decided not to let the anime hinge on a single element. -----Of course an anime with a premise such as this one wouldn’t be complete without music, something which the show constantly keeps in mind. This is where The [email protected] is at its best; every concert has a new song to sing, every idol has her own personal theme, every episode introduces a new tune. Every character song captures the personality of the idol it belongs to, whether it is the mischievous duo of Ami and Mami or the ever serious Chihaya, and retains its quality if only for the character associated with it. And with thirteen different idols it is almost a guarantee that someone will find a theme to like. The non-character tunes aren’t any less impressive either, as they summarize the general mood of each episode as the ending credits appear on the screen; there’s never a case of the music contradicting the mood, but it is guilty of consistently and thoroughly complementing the tone. -----It would be a fair assumption to say that most of the people who would watch a show like this only have an interest in the characters, but unfortunately the development methods, screen time distribution, and prodigious size of the cast itself doesn’t make it the best show for an attractive character to entice the viewer. But if one is willing to look past that and watch it for its realistic and honest take on becoming and being an idol, he or she will find The [email protected] to be a very solid choice. GLORIOUS!! another on the list of Faves. The person who told me about this series did NOT do it justice. I'll deal with him later, though, LOL. This has a wonder story. Though the plot is simple, it has TONS more backing it. 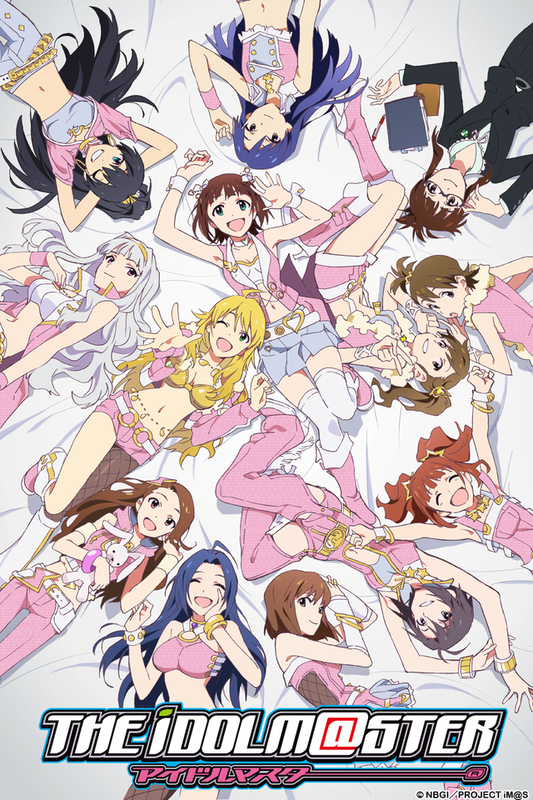 12 girls strive to become idols. With a new manager, and a LOOONG road ahead of them., they face rejection, heart break (on AND off set), drama, but also have fun along the way. Deffinitely a good watch for a good story. only thing i had against it was it tstarted to look like "Reality TV" during part of season 2... But I forgive them. and i recommend this to anyone who either has, hasn't or wants to play the game. I haven't played them, yet, myself. but have heard awesome reviews. So... the first episode is not that great. In fact, after I watched the first episode I decided to not watch anymore of this anime! And... that was a mistake, a big one! A week or so ago I decided to give it another try. I watched the first episode again, and again I wasn't very impressed. But I chose to keep on watching. The second episode was quite better though it still wasn't tops. See, it's just that this anime is a bit slow to pick up. Despite this, the majority of the episodes are actually very good, in fact some of them are just superb, brilliant, awesome!!! There are very good episodes throughout, and the arc that leads toward the end is very good too, including the ending itself. Unfortunately, there are a few average episodes here and there and most of them happen to be... towards the beginning. So that's the reason I gave the storyline less than the best score. Nevertheless, I still rated the storyline at 4.5 of 5, and I even gave this anime the best overall score. So why is this??? After you watch the first few episodes things will become much better overall and I gotta say that by the end I was very, very glad I watched this anime! Ultimately, I consider it to be a great anime and to be one definitely definitely worth watching. If the topic seems interesting to you even in the least, then I highly recommend this anime to you! Dang, now I want to watch the sequels. Are there going to be sequels? Please tell me there are going to be sequels!!! The first time I heard of this anime was last year 2011 when it was being simulcasted by CR. When I read the basic premise "Idol group trying to be the best in Japan", I'll be honest, I wasn't interested. But since the artwork seemed good enough, I put it in my to watch list. I've only recently come back and started watching this and finished last week. I'll have to say, this has been one of the most surprising anime I've watched, in terms of how much I came to like it after previously approaching it with skepticism. Storyline/Character: The story seems pretty basic at first glance, as I've said before, a 12 member idol group is trying to make it as the best in Japan. Along for the ride are 2 producers, the office clerk, and president of the production agency. This may seem pretty basic but what makes the story much more complex are the individual idol character's pasts, motivations, resolve, emotions, etc that interact to make the story that much more alive. There is also the standard antagonistic force which comes in the form of a rival production agency, and though the tricks and ruses schemed by them may seem childish, each challenge that the idols face helps with their character growth. All the characters have individuality and their own history. As mentioned before, the anime explores how the idols rise to the top as well as examine each character personally, seeing how they think, how they change, etc. Also, none of the characters are "abandoned" or "forgotten" after their focused episode but rather continue to be an active part of the story. This was a major gripe I had with other anime with a large cast, where characters seem to lose their worth after their own personal episode. You may even grow attached to some of these characters, some moments you will want to know what happens to them next, you will cheer for them , you may even feel the pain they experience as they aim for the best. Animation: Top notch work by A-1 studios in my own opinion. It seems that no expenses were wasted in developing this anime, as compared to other works by the same studio. Again and again, they prove themselves that they will make a visually stunning and pleasing anime as is also the case for The Idol Master. Background work is highly detailed and movements are smooth. Each character is styled and detailed just right. Music: Well, since this anime is based off the video games that focus on music, it is to be expected that the music used in the anime should also be good. And it is! Each episode ends with the focus idol singing a song that matches the theme of the specific episode. There is not a whole lot of background music, rather the music only comes up at certain pivotal points in the episode and I have to say this works out rather well. This show gives an enjoyable face to what was already a strong multimedia franchise. I'm watching it all over again, months after it originally appeared, and enjoying it all over again. The anime fills out the back-story that those of us who didn't play the Japanese games can't directly appreciate. I like anime idols performances, in general, but this has made me like Idolmaster in particular. Makoto and Yukiho are my all time otp along with some crack ships here and there BUT I WILL FOREVER SHIP MAKOTO AND YUKIHO FOR THE REST OF MY LIFE. Makoto is just too badass js.